In this highly anticipated second novel by the author of the award-winning, best-selling The Thing About Jellyfish, being the new kid at school isn't easy, especially when you have to follow in the footsteps of a classroom prankster like Paulie Fink. When Caitlyn Breen enters the tiny Mitchell School in rural Mitchell, Vermont, she is a complete outsider: the seventh grade has just 10 other kids, and they've known each other since kindergarten. Her classmates are in for a shock of their own: Paulie Fink - the class clown, oddball, troublemaker, and evil genius - is gone this year. As stories of Paulie's high jinks unfold, his legend builds, until they realize there's only one way to fill the Paulie-sized hole in their class. They'll find their next great Paulie Fink through a reality-show-style competition, to be judged by the only objective person around: Caitlyn, who never even met Paulie Fink. Who was this kid, anyway - prankster, performance artist, philosopher, or fool? Caitlyn's quest to understand Paulie is about to teach her more about herself than she ever imagined. 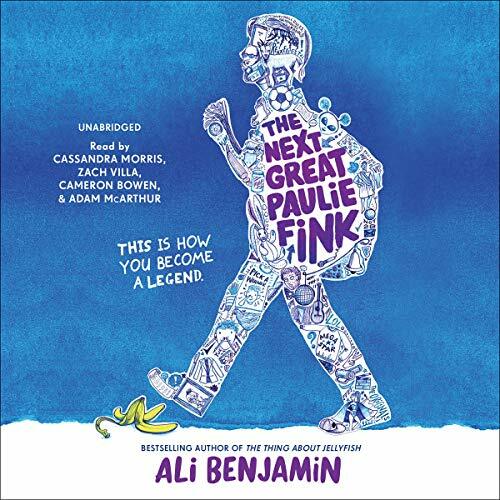 Told via multiple voices, interviews, and other documents, The Next Great Paulie Fink is a lighthearted yet surprisingly touching exploration of how we build up and tear down our own myths...about others, our communities, and ourselves.